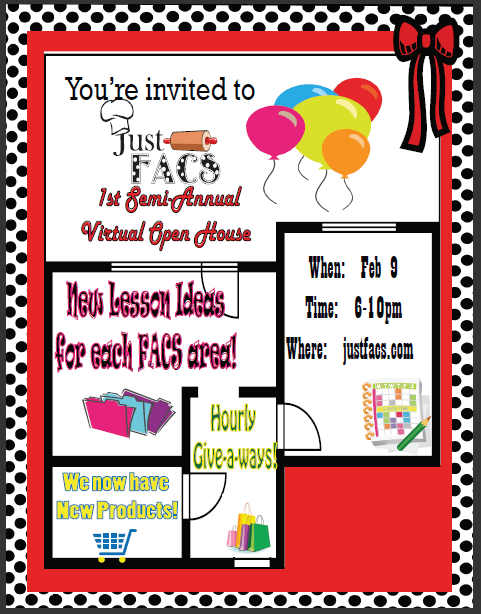 Just FACS presents “1st Semi-Annual Virtual Open House”! I know it may seem as though I have been neglecting the site and I kinda have. But, in my defense, I have been working on some new projects and new resources. We all know that February is a very busy month for FACS and CTE and if you are feeling burnt out for ideas, you can check out some ideas from the past here and here. However, for a sneek peek at what I’ve been working on you will have to join us on Thursday, Feb.9 at 6pm. Just FACS will be having its 1st Semi-Annual Virtual Open House!!! Check out the flyer for more details. I am so excited and cannot wait!!! Hope to see you there because you will not want to miss this!! I love this site – and am excited to see more resources uploaded! 🙂 Can’t wait!